Nothing feels right, right now. But not in my chest today. That won’t be filled today. To help them live on. 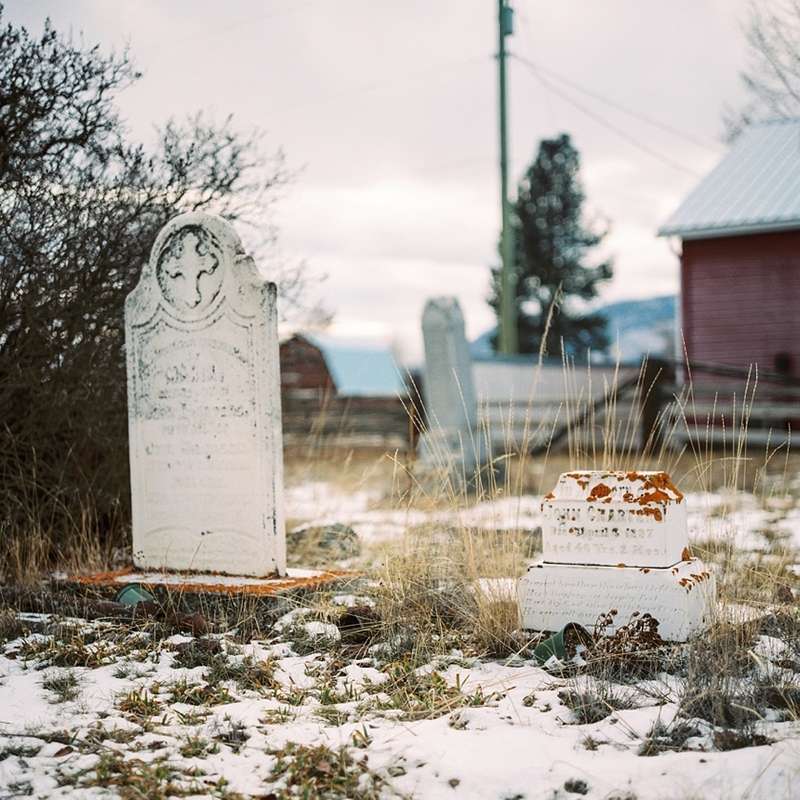 Simple headstones bearing loving testimony to the otherwise forgotten. A place of timeless, simple beauty, destroyed. And try to become whole again. For now the sadness burns brightest. The meaning is painful and unknown. They are not here today. Yesterday I received some sad news; news of an irreplaceable loss. 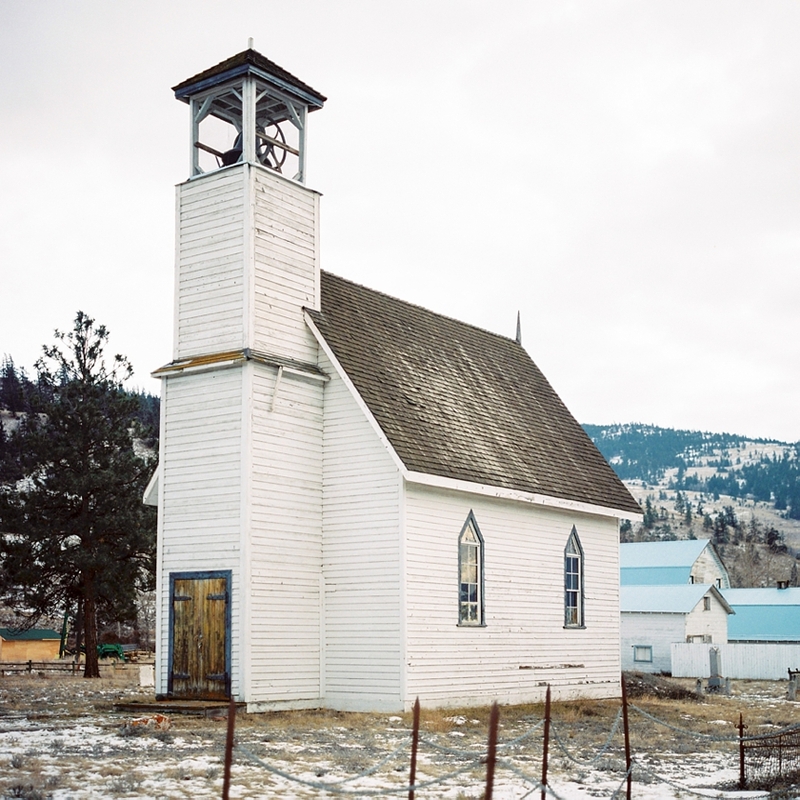 Murray Church – a picturesque and historic building in the heart of the beautiful Nicola Valley – was destroyed; burned to the ground for who knows what so-called reason, by arsonists. Murray Church was a very special place for Christian and I; one that we have visited every time we’ve travelled through the area. It’s a little off the beaten track, and we first encountered it nearly ten years ago on one of our road trips through the BC interior, before we moved here. We’d read about it in a lovely book called Country Roads of British Columbia by Liz Bryan, and reading her description, it became a ‘must visit’ on our trip planning list. We fell in love with it at first sight. The peaceful atmosphere, breathtaking scenery and the still, timeless beauty of the church, etched itself into our minds. Returning to the car to continue our road trip, we laughed as we had to pick bits of spiky plant from out of our shoes: they grew all around the enclosure surrounding the church. We had a photograph we took of the church on that trip printed on a large canvas, and it has formed the centrepiece to our bedroom, both back in our Chesterfield home, and again now here in Hope, BC. 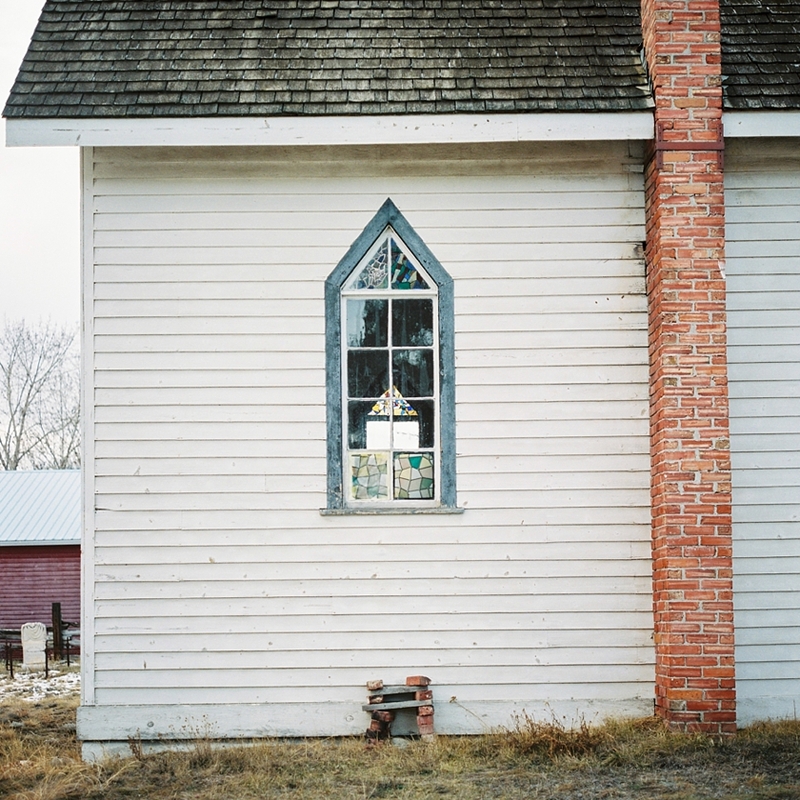 When my family made their first visit to our new home in Canada back in spring 2017, we took my sister Holly and her husband Matt on a re-creation of one of our early road trips, and Murray Church was one of our stops. I’m so pleased they were able to see it before it was destroyed. I know this is a building, not a person, but I feel such a strong sense of loss for this beautiful, magical place. It’s so important to treasure everything in life that brings us happiness. I’m sure the people who live nearby and have worshipped here will feel an even stronger sense of loss, but here is my small tribute. I have two sets of things saved up for my Blog. One is a list of topics that I’d like to write about: musings and ideas that I think have the potential to be interesting or helpful to other people. The other is hundreds upon hundreds of photos, many of which I love, having felt deeply inspired to capture them, and then – seeing them on-screen after I developed and scanned the film – happily satisfied with how they fulfilled my vision. So why the backlog? I would say I haven’t found a way that makes sense to me, to share my ideas, and to share my photographs. I have considered various options, and so far I’ve tended to separate them out into photographic blog posts, and personal ideas/musings blog posts. The problem I was finding was that publishing photographic blog posts felt much ‘safer’, so I just stopped writing the other kind. Then, partly because this made me feel bad about myself (too scared to write personal thoughts in a blog post = reason for self-criticism = avoidance) and partly for other reasons, I stopped publishing photographic blog posts too! I was motivated to try to resurrect my blog, because of a personal journey that I’m on, part of which includes an aim to try to share more of myself, if I find something worth sharing. And I kind of realised that sharing anything – as long as it is something positive and kind-hearted – must be more worthwhile, and potentially helpful to others, than sharing nothing (which is what I’ve pretty much been doing for most of 2018). My theme here is the barriers we can put in our way to acting. In my case I had a desire to share something positive: pretty pictures, and words that I thought might be helpful. But time and time again I stopped myself. Or as this note for a blog post idea I found on my phone today puts it, ‘Thinking about how I can talk myself or indeed think myself out of anything. A blog post that starts off as a great idea I never end up publishing [because I overthink it into meaninglessness]. Self-doubt contributes, then anxiety about others’ (anyone’s?!) opinion, or looking stupid, then finally a feeling that it’s entirely pointless anyway.’ Wanting things to be perfect before we put ourselves out there; wanting to avoid any possibility of failure; anxiety; depression; low self-worth; feeling we have nothing meaningful to contribute; existential crisis…any one or more of these and a hundred other painful, debilitating things can get in the way of us expressing ourselves, and it’s such a shame. The photographs that appear below turn out to have some vague connection to my writing after all, but it wasn’t planned that way (which could be liberating for my future blog content!) I shot them in a very relaxed way, without overthinking, and without worrying too much about how they’d turn out and whether they were ‘worth’ taking. I shot them simply for enjoyment, as I strolled along the waterside in the beautiful fishing village of Steveston near Vancouver. I felt peaceful and free, and quietly inspired by the soft light and the subtle autumn colours. So I took the photos with the minimum of self-doubt or censorship, and I share them here – along with all my thoughts above – in the same open-hearted vein. Well, perhaps the sharing part comes with quite a bit more self-doubt, but I’m doing it anyway! So beautiful, I love the colours and scenes that you’ve captured. And I really hope to see lots more of your beautiful photos and carefully crafted words up on your blog soon! Beautiful photos Erica! I love that line about “overthinking into meaninglessness” it’s definitely something I struggle with often when it comes to sharing photos and captions! I have such a backlog of film to shortlist, edit, blog, and maybe even print, and at times I find it quite upsetting! So many images to be properly discovered and appreciated (by me I mean! ), but most of the time I only just manage to find time to develop and scan my film, and then the results have to wait patiently on my hard drive, hoping they won’t be forgotten. I love the process of taking photographs, and then the fact that I don’t get to see them straight away. Then it’s such an exciting feeling, waiting for each image to come up on the scanner, able to see for the first time how well I’ve captured whatever beauty it was that inspired me to press the shutter button. And then I want to do more, create more, get and give more from my images. Putting together a blog post can be a rewarding next step in that creative process, but too often I find myself holding back in some way and for some reason. Sometimes this delay can occur for the simple reason that my eyes and brain are just too tired from working on my clients’ photographs in the lab, to want to strain them further by working on my own photographs. Sometimes I might feel I have something to say to accompany the images, which I overthink until it feels like there’s nothing meaningful or worthwhile left. This time around I’ve taken my delay tactics a step further…I actually put together this little collection over a month ago, pasted them into the blog and then ran away before the words would come! I took these photographs during the Christmas holidays last year, when we had a wonderful trip to see family and friends back in the UK on our first visit since we moved to Canada. This pretty town is Bridgnorth in Shropshire, very close to where my sister lives, and I enjoyed a ramble around its charming narrow streets with my family, armed with my Canon AE1 and my ‘go to’ winter film, Kodak Portra 800 (as always I then developed and scanned the film back at my lab, Canadian Film Lab). This was a lovely day, with great company, and lots of interesting and engaging sights. What I love most about these images is that I feel the film has transcended what was actually quite flat light. I’m usually inspired by contrast in light; by shadows and sunlight, whether that be in the form of vibrant direct light, rich, colourful shade, or soft, subtle backlight. Grey days – unless they’re moodily dramatic – don’t usually float my photographic boat, but I was quite keen to capture lots of uniquely British images on this trip, particularly of the types of architecture that I miss, and so I took photographs even when the light wouldn’t usually compel me to do so. And I love how they turned out! So the moral of this particular photographic adventure for me was to be prepared to take a few risks, taking shots where the outcome is a little uncertain, and trusting that with sound shooting, film can produce subtle, beautiful results in unexpected circumstances.